Fudge isn’t product we would usually consider gourmet, refined or adult. Saccharine by nature and often presented in huge blocks at County Fairs and Village Market Stalls, it’s not a confectionary that we thought we would ever have cause to promote on Sated. However, Fudge Kitchen’s Mixology Confection has given us something to shout about. Created in partnership with multi-award-winning local micro-distilleries, brewers and producers, Anno Distillers, Nip from the Hip, Rubis and Biddenden, Fudge Kitchen’s Mixology Confection comprises handmade, booze-infused fudge bites that marry the 35-year-old company’s celebrated creamy recipe with artisan tipples. Kent-based Anno Distiller’s 60 Squared gin is matched with bitter orange and a peppery cubeb zing before being decorated with orange chocolate. Bright and citric, this is a fresh and delectable piece. Two staple gin ingredients pair with Anno’s London Dry gin to produce a zippy fudge whose lime cuts through the sweetness. Decadent and moreish; rich cherries soaked in fortified Tempranillo wine are underpinned by premium chocolate to add a sultry charm to Fudge Kitchen’s Mixology Confection. Infused with Nip from the Hip’s fragrant strawberry vanilla vodka, this morsel’s sweetness is tempered slightly by the inclusion of black pepper, however it is still incredibly sweet and floral. 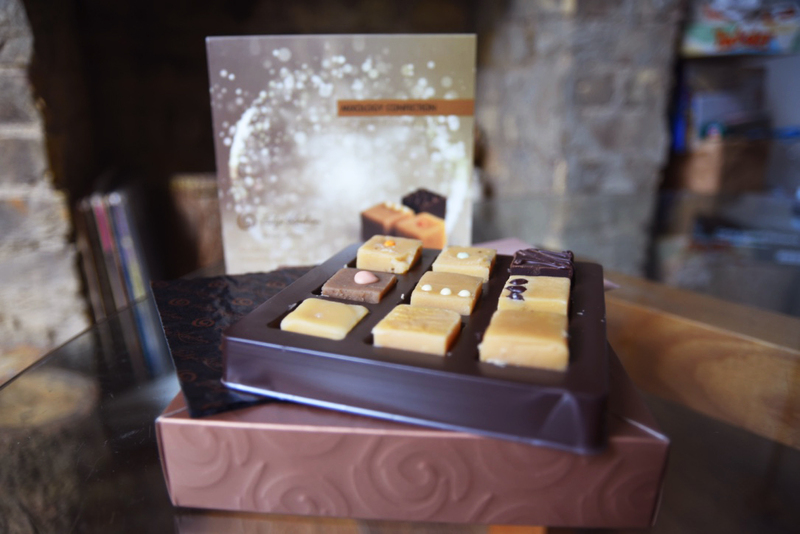 We have to admit it has never previously crossed our mind to pair brandy with fudge, but Fudge Kitchen have stumbled upon something marvellous here; the slight woodiness and natural honeyed nature of the brandy pairs perfectly with the creamy fudge. Similarly, the character of the Scotch whisky works beautifully with the dense fudge. Fresh ginger plays with the spice from the barrel and the dark chocolate embellishment ties the flavours together. Biddenden Special Reserve Cider, matured in oak whisky casks for 18 months, pervades this piece. Fruity notes are prevalent from start to finish in this scrumptious titbit. Unapologetically creamy, this is essentially a solidified, slightly sweeter version of Irish Cream. The flavours in this delight are powerful and exciting. The rich rum fudge bursts with juicy raisins and makes us want to cut it up and serve it over a scoop of vanilla ice cream. Fudge Kitchen’s Mixology Confection retails for £10 and can be purchased from Fudge Kitchen’s website – because why wouldn’t you want fudge shipped directly to your house?! – and selected stockists.